As per the report, the airline company has canceled flights from Delhi, Kolkata, Chennai, Bengaluru, and Hyderabad. InterGlobe Aviation (IndiGo) is likely to cancel 32 flights on Monday amid the shortage of pilots, a PTI report suggested. As per the report, the airline company has canceled flights from Delhi, Kolkata, Chennai, Bengaluru, and Hyderabad. The carrier canceled around 15 flights on Saturday and around seven on Sunday. The media report also stated that the airline has been facing problems in crew management. Therefore, flights were canceled. 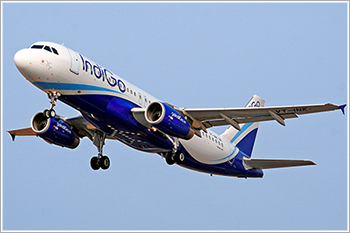 In a statement, IndiGo said that due to a severe hailstorm in North India on February 7, 11 IndiGo flights were diverted and that disrupted operations across our network the following day, the media report said. Interglobe Aviation Ltd's share price ended at Rs1,195.95, down by Rs8.25 or 0.69%, from its previous close of Rs1,204.20 on the BSE. The scrip opened at Rs1,195 and touched a high and low of Rs1,211.75 and Rs1,190.25, respectively. A total of, 13,158 (NSE+BSE) shares have traded on the counter. The current market cap of the company is Rs45,973.14cr.